CRYOSCAN and Hiden Analytical propose a complete solution for automated plasma mapping thanks to manipulators equipped with a (radio-frequency compensated or not) Hiden ESPION Langmuir Probe. 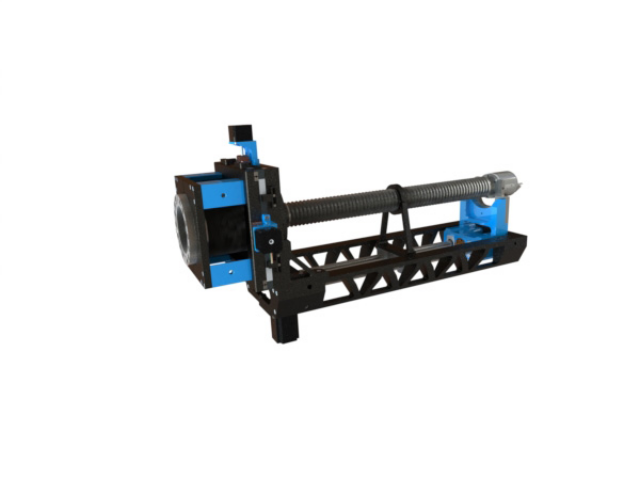 The robustness of the design together with the quality of the mechanical parts insure a great accuracy in the positioning of the probe, thus allowing the creation of 3D representations of the different plasma physical parameters (potential, densities, electron temperature). The solution includes a software suite that allows for the programming of several thousands of probe positions as well as the automatic recording of probe current-voltage characteristics. Tested in low pressure plasmas, the solution is compatible with most of the laboratory plasma conditions. Our automated probe has been originally designed for studying the interactions between low-pressure plasmas and radio-frequency antennae. 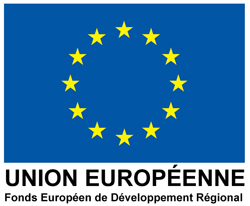 It has been extensively used to map in 3D the physical properties of Argon and Helium plasmas in the vicinity of the RF antenna. Floating and plasma potentials, as well as the electron temperature, are usually straightforwardly derived from the current-tension (I-V) characteristics so that the determination procedure may be applied automatically. Ion and electron densities are not so easy to determine and need manual checking. Results derived from these measurements have presented in different plasma conferences and published in peer-reviewed journals (see Scientific Publications). 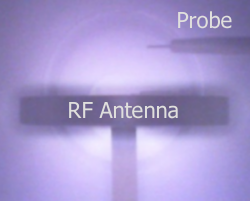 Radio-frequency (RF) antennae are widely used in plasma physics. 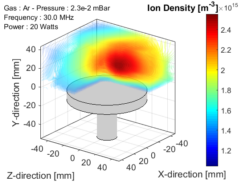 In fusion devices such as the international tokamak ITER, Ion Cyclotron Resonance Heating (ICRH) antennae usually are the main additional plasma heating devices. In laboratory experiments, RF antennae are used to generate the plasma, as in magnetron where a 2.45GHz excitation is used to excite the electrons of the plasmas. 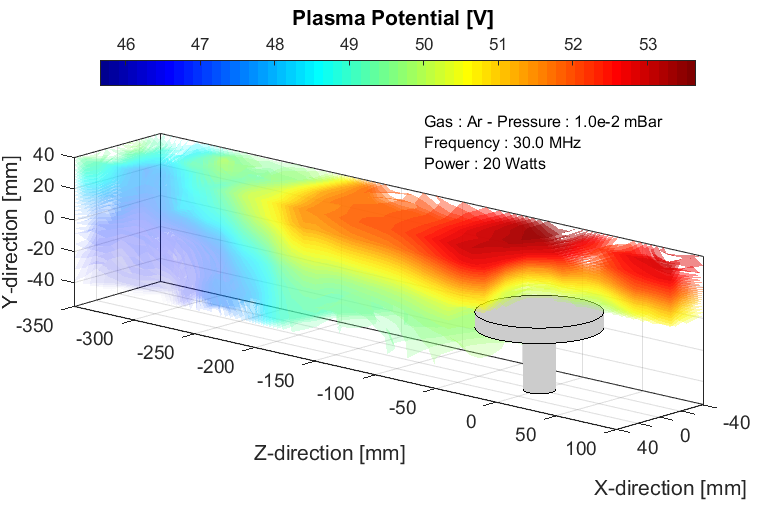 Even if RF antennae have been used for decades, the plasma-wall interactions are still very actively studied. 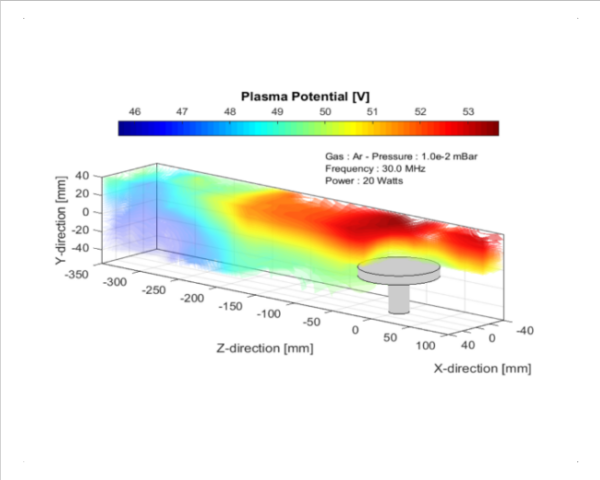 The figure presented on the left shows a 3D map of the plasma potential around such an antenna in a weakly collisional Argon plasma, investigated thanks to our automated Langmuir Probe. The Debye Sheath, of about 1cm, is clearly observed around the top of the antenna (grey disc). The plasma potential stays fairly constant on top of the antenna up to a distance to 15 cm and then smoothly decreased with the distance. The full analysis can be found in papers listed in the Scientific Publications tab.